It is always fun when I can look back at my past blog posts, see what I learned from a lesson, and reflect on student reasonings before I teach that same lesson again. 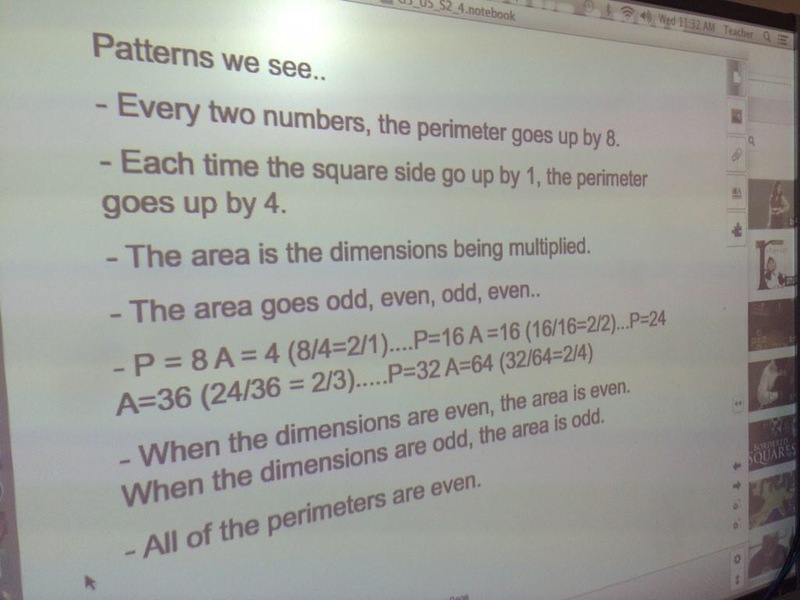 This past week we were working on this lesson from last year: https://mathmindsblog.wordpress.com/2014/01/27/area-and-perimeter-of-squares-student-noticings/. His explanation focused on the pattern of the fraction the perimeter is of the area. The numerator stayed a two and the denominator went up by one on every even dimension. I honestly didn’t know what to ask him because the question “Why is that happening?” seemed way to broad. He played around with building the squares and was not getting anywhere. I am thinking, after chatting with Christopher (@trianglemancsd) on Twitter, that focusing on the meaning of the fraction first may be the way to go?? Basically, I first have to sit down and reason about his on my own…gotta love math homework on vacation! 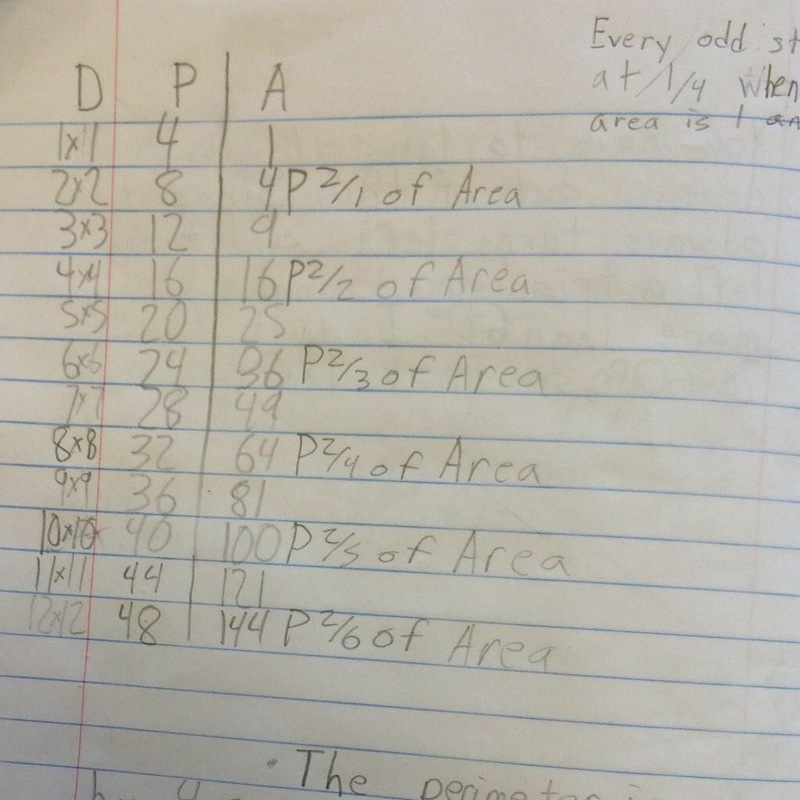 This entry was posted in 5th Grade, Geometry, Perimeter and Area, Uncategorized on December 20, 2014 by mathmindsblog. Hi – I thought I left a comment the other day about my thinking, But, now I do not see it here. Maybe I forgot to hit the words POST COMMENT! Anyway, I was thinking about your students discovery and though – what does the area need to be multiplied by in order to obtain the perimeter? n^2 times what equals 4n? That factor turns out to be 4/n, which can also be written as 2 divided by (n/2). Notice how n/2 becomes a whole number when n is an even number. 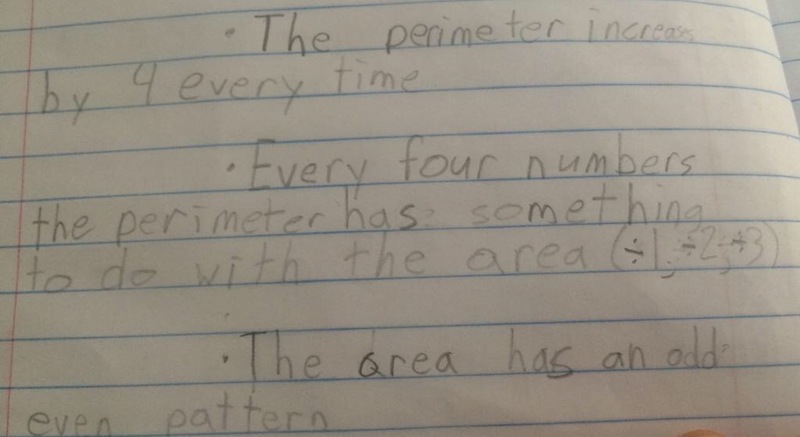 Great pattern sniffing by your student! !